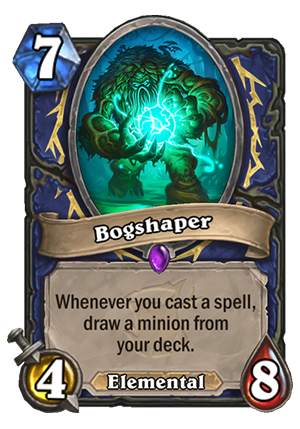 Bogshaper is a 7 Mana Cost Epic Shaman Minion Elemental card from the The Witchwood set! Whenever you cast a spell, draw a minion from your deck. Rating: 3.3/5. From 1796 votes. I feel like this one is too slow. If you play a slower Shaman deck with Hagatha the Witch you probably already have lots of late game value. Do you really need to play more? Also, we need to look at the average case scenario, not the best case scenario. This is unplayable on the curve. Well, not completely unplayable, but a 7 mana 4/8 does nothing against Aggro and will be removed by Control before you get the value. The effect? Well, if you want to draw cards when playing spell, you can already do that – Gadgetzan Auctioneer is a thing, you know. Yes, it has 4 less health and no Elemental tag, that’s a big deal, but one mana cheaper means that it’s easier to cycle with it + you can draw spells too, so you could potentially draw a spell into another spell. Yes, thanks to the extra health and Elemental tag, I’d say that it’s a little better than Auctioneer, but I wouldn’t say that it’s MUCH better. Also, how many cheap spells will you put into your deck in the first place to take advantage of this card? 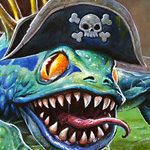 You don’t have Preparation like Rogue, and you don’t want to play spells like Lightning Bolt or Totemic Might. Well, you MIGHT have a bunch of cheap spells from Hagatha lying around, but it means that you’ve already played Hagatha and some minions, so it’s way past Turn 10. Which makes it even slower. Another thing is that this kind of effect is most likely to work in slow matchups, but at the same time, drawing a bunch of cards in the late game might not always be good in the slow matchups. That deck looks like something aspiring to win some fatigue games, and you can’t win fatigue games if you draw too much. But that’s a more minor issue, as only a small fraction of the games actually end up in fatigue. All in all, I could maybe see this as an one-of in a slower meta to get some more refill in the late game. In a faster meta, it definitely gets out of your deck immediately. Looks like a pretty average card. 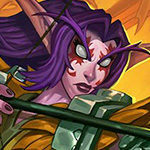 By the way, great work stonekeep for the in-depth analysis of the new cards! Are you supposed to play this with Hagatha and Witch’s Cauldron? Blizzard is making it obvious: Hagatha Shaman is Elemental Shaman. Control shaman, Miracle shaman, LETS GO!!!!!!!!! Show them Shaman mains need no Jades or Tunnel troggs to carry us! I can see this be rather useful in an Elemental Shaman deck. It can help you keep up the Elemental synergies and it does combo well with Hagatha if anything. The stat line is pretty reasonable for a card that can draw multiple cards like this can, and can be used in combination pretty easily with Unstable Evolution. If Elemental Shaman become viable again, which it probably will to some extent since Un’Goro cards are still legal, this will be an important part of it to keep up the late game pressure. 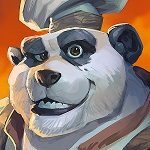 Nice in theory with Elemental Shaman … but to make the deck work you’re probably not going to be running that many spells; the powerful battlecry effects take the place of most spells – especially if you’ve got Grumble and Murmuring Ellies in the deck. Cough. HAGATHA. She generates spells for you. She’s also kinda pricey – drop a Bog Shaman on 7, Hagatha on 8 and you won’t see the benefit of either until turn 9 – assuming the Bog Shaman survives that long – which is unlikely (especially since Hagatha is going to blast it for 3). Though you could squeeze a couple of Ancestral Healings into the deck I guess. Otherwise you’ll not be looking to drop Bog Shaman before turn 9 at the earliest. The synergy is there, sure, and it’s theoretically awesome… but it’s really, really slow. Elemental Shaman also runs a lot of minions – it has to – but when you play Hagatha you’re going to deal 3 damage to all of them, so I’m not 100% convinced that Hagatha is that great a fit in an Elemental Shaman deck **yet**. 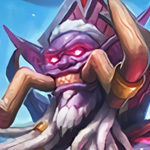 The ideal would be to play Grumble with a Bog Shaman on the board just before Hagatha – all your minions get returned to your hand and have their cost reduced to 1. Playing Hagatha is going to blast everything for 3, but hey, Grumble will probably be dead now anyway… and THEN you can drop Bog Shaman for 1 and hope for a cheap/useful spell from Hagatha. To be honest, I suspect it’ll be better to skip Hagatha and just put a couple of Unstable Evolutions in your deck – you *know* you’re going to have a repeatable 1-cost spell then, rather than whatever random, overload-laden, situational spell you could get from Hagatha. it costs 1 more mana and has 4 more health. It might be worse but it is certainly not much worse. I personally think it will be great, especially with the elemental tag. It’s got twice the health of an Auctioneer and you can reduce the cost with Fire Plume Harbingers… either way Shaman has a 1 mana spell with Echo in the form of Unstable Evolution to power the card draw. Hell, if you can bounce Bogshaper back to your hand with Grumble it becomes a 1 cost minion. Drop it again with a Fire Fly (or token) and Unstable Evolution on that and you’ve got a 4/8 plus an up-to-9 cost minion and as much card draw as you like. In the right deck this is better than Auctioneer. Ohhhh so this is the spell-generation rotation Blizzard wants to give Hagatha Shaman so it can somehow compare to Lyra. If you have Hagatha, you play this minion, get a spell. Then play the spell, draw another minion, play it, generate another spell, ad aeternum. Well, it’s much more clunky, since you still have to pay minions to generate spells, so it won’t cycle as effectively as Lyra. Also, in the late game you can risk milling or running out of cards, and you never want that as Control. The last piece of the puzzle would be an understatted minion with Battlecry: shuffle a copy of this minion into your deck. Then the Control Hagatha minion-spell cycle would be complete. As for the minion, clever distribution of stats: 4 attack to survive Priest, and 8 health is not easy to remove in one turn without board presence. I can see this surviving one turn after it comes down, which would give enough value to justify its 7 mana cost. Also, Elemental tag, that’s important! Fire Plume Harbringer might actually start to see constructed play now that some neat “combo” Elementals are showing up. This card will actually **** up my mind for 2 reasons : first, it’s an Elemental and Shaman has a lot of excellent Elementals you want to have in hand (Kalimos, Grumble why not, Fire Elemental, Snowfury Giants). Second, the way the card works may allow control Shaman to play a lot of big minions and Unstable Evolution, the best spell to play with this card I think. I can’t say if it’s good of not but it has a nice potential I will try to exploit in theorycrafting, I would be really sad not seeing this played at least in one special archetype! And also, its stats are a little weak but very defensive (especially against priest who hates 4-attack minions) so it can survive several turns. 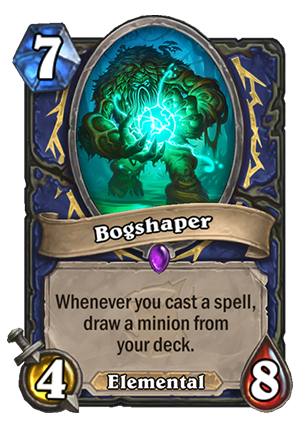 Now even by itself that’s not bad, but also consider that of those 21 spells, 6 cost 2 mana, 6 cost, and 2 cost 0, so often times you’ll get 2 shaman spells AND draw 2 minions the turn this comes in, if not more. So when you consider all of these things this card becomes comparable to UI, albeit less consistent, but in exchange for losing the consistency you gain a better stat’d minion and the potential for addition value on subsequent turns. I’m not saying this card is amazing, but I think it’s a lot stronger than it looks at face value. Can any shaman spells go face? If not, playing by the time you play this minion it might be too late. Could always try to evolve it into something better I suppose. 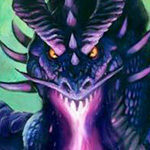 I think 4/8 Primordial drake is much better. At least that has taunt and has an immediate effect. Lastly, I think playing this in a deck that has Hagatha is waaaaay too greedy. By milling the Shaman class you’d be doing them a favor – saving them from playing pure RNG spells. When i saw this card the possibilities with hagatha became clear for me, running a minion heavy (mostly elementals) shaman with hagatha. Maybe run double lightning storm for early game. Kind of like keleseth rogue but a bit slower. Can’t tell if it’s good but shaman is getting card draw options which it definitely wanted.